Somehow, it all had to get through the front door at 29 West 23rd Street. Squeezing printing presses by hook or by crook into the tight confines of New York City graphic arts buildings is nothing new. But, with the shrinkage of the metro area’s printing industry down to a sliver of what it used to be, it’s a spectacle not much beheld any more. 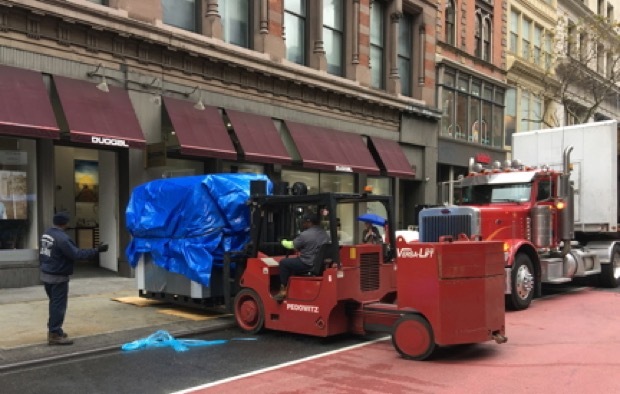 A few months ago, however, Duggal Visual Solutions revived the tradition by wedging—almost literally—the bulk of an HP Indigo 12000 digital press through the lobby of its production center at 29 West 23rd Street in Manhattan’s Chelsea district. The press is the only B2-format HP Indigo digital press in Manhattan and the first commercially-released HP Indigo 12000 installed in the U.S. That’s in keeping with another tradition: Duggal’s 56-year penchant for being first and foremost when it comes to technical capability for graphic reproduction. When Baldev Duggal started the business as a photo processing lab in 1960, digital printing didn’t exist even in imagination. At that time, the graphic arts were almost entirely film-based, and visual content came chiefly from the cameras of professional photographers—customers whom the company continues to support with some of its most advanced imaging solutions. The founder’s first innovation was his invention of automated dip-and-dunk developing—a rollerless method that protected films against scratches and contamination during chemical processing. As digital photo imaging began to emerge in the early 1980s, the company leapt ahead of the trend by becoming the first lab to offer high-resolution drum scanning. With wide-format output added to its menu of imaging services, Duggal Visual Solutions distinguished itself again in 1992 by wrapping an entire building with a giant-sized graphic—a feat that no other imaging service provider had accomplished before. The coffee-themed wall artwork in Starbucks outlets around town, for example, is imaged on Duggal equipment. Most of the city’s major museums are Duggal customers, as are upscale retailers, advertising agencies, fashion houses, galleries, design studios, and other purveyors of high-end visual imagery throughout the metro area. The word was “gingerly,” as there was little room to spare. There’s very little in the way of graphic output that this omnifaceted imaging emporium can’t offer its customers—and now, with the addition of the HP Indigo 12000, probably nothing at all. Its imaging services run the gamut from conventional film processing and reproduction—still an important part of the company’s business—to digital retouching and proofing, lamination, wide-format and flatbed printing, signage, multimedia, package prototyping, digital offset printing, and 3D printing. Duggal also weds visual images to physical spaces with services such as mounting and framing, display fixturing, lightbox fabrication, custom wallpaper and textiles, exhibition and event design, and project management for retail store rollouts and similar undertakings. A good deal of this activity takes place at the Chelsea facility where the HP Indigo 12000 is now at work. Opened in 1999, the 30,000-sq.-ft., street-level space serves as Duggal’s corporate headquarters as well as a production site and a creative atelier. The location, just around the corner from the famous Flatiron Building, is only a few blocks from the street where Baldev Duggal, eager to be in what was then the heart of New York City’s photo district, started the business. With its classical interior columns of elaborately wrought iron marking off spaces packed with production equipment and dramatically displayed samples, the site is half printing factory and half fine-arts exhibition hall. Making it hum are the kinds of production systems that continue to set Duggal apart from other businesses of its type. The facility offers, for example, a process it calls Vibrachrome: a two-step method that uses heat to transfer dye-sublimation images from paper to metal and other media at 1,440 dpi. Even more impressive is the technology behind Duggal’s HD C-Prints: stunningly clear, exquisitely detailed photographic images on archival photo paper and display film at an apparent resolution of 6,100 dpi. This is courtesy of an Italian-made laser exposure system originally employed by U.S. military and intelligence services to print satellite images and surveillance footage. As is its wont with exotic imaging solutions, Duggal was the first company to put the system to commercial use. Customers who want to understand the full extent of what Duggal technology can do for them gain that knowledge at the site’s Innovation Lab, one of two operated by the company. Here, in consultation with Duggal imaging experts, they can discuss creative concepts and develop approaches to realizing them. As formidable as the 23rd Street center is, it’s far from being the largest part of the Duggal Visual Solutions platform. The company, which employs 375 people, operates a total of eight production facilities in Manhattan and Brooklyn. Most of the combined 200,000-sq.-ft. footprint is located in the Brooklyn Navy Yard. That industrial enclave is home to a cluster of Duggal sites including Building 25, a 100,000- sq.-ft. manufacturing center that is the first U.S. printing facility to obtain LEED Gold certification from the U.S. Green Building Council. Nearby is the Duggal Greenhouse, an eco-friendly venue for exhibits, events, conferences, and artistic rehearsal. Note the classical wrought-iron supporting columns: 21st-century digital printing technology in a setting a bit reminiscent of the 19th. 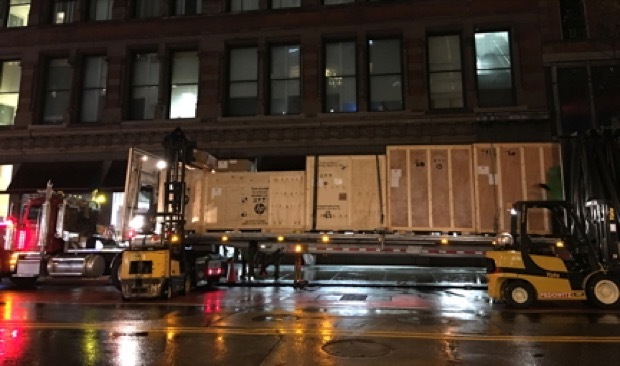 If extra space from one Duggal building could be grafted onto another Duggal building that needed more room, that magic trick would have come in handy at 23rd Street upon the arrival of the new digital press. The HP Indigo 120000 is a B2-format (29" x 20") machine, and B2 equipment isn’t compact—a reality that obliged the facility to dismantle some of its street-facing facade in order to shoehorn the device inside. After passing through the entrance with barely enough free play to spare, it was set up in a space just off the lobby—the idea being, Lovci says, to situate it as close as possible to visiting customers. Its room adjoins an enclosure where Duggal operates its HP Indigo 5900, a 13" x 19" device that the company transplanted from Brooklyn to Chelsea three years ago. Duggal personnel liked what they saw in the B2 press at last year’s Dscoop and drupa events. After that, adoption was swift. Brian Renaldo, assistant manager for Indigo production and finishing, says that HP technicians completed the installation over four days in mid-October and that live production commenced a week later. The HP Indigo 12000 represents “the final piece of the Duggal puzzle” in terms of what it adds to the product portfolio, says Demian Cacciolo, who manages prepress and production. He explains that device’s 20" x 29" format, its seven-color inkset, and the breadth of its substrate range make it the digital press Duggal needed for catalogs and other high-quality collateral material in short runs, with or without variable printing. Those working with the HP Indigo 12000 at Duggal have found that the press can keep up with the strenuous requirements of the production environment it belongs to. It has printed, for example, 1,500-sheet jobs comprising 10 different substrates without jams or interruptions. The press can match 90% of the Pantone gamut and insure corner-to-corner color consistency and registration accuracy with adjustment on the fly. With its high running speed—up to 4,600 sheets per hour in 3/0 and monochrome modes—it’s suitable for volume production as well as short-run work. 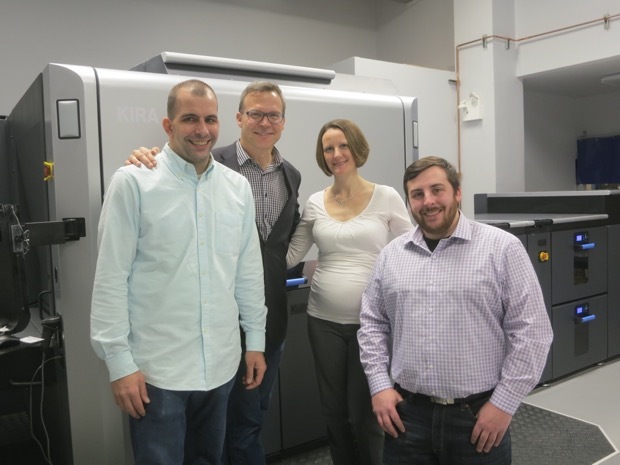 With Duggal’s HP Indigo 12000, from left: Demian Cacciolo, prepress and production; Marc Lovci, vice president business development; Heather Griffin, marketing director; Brian Renaldo, assistant manager, Indigo production and finishing. The machine has special abilities that impress even the digital imaging experts at Duggal. One of them, says Cacciolo, is a media fingerprinting technology that lets operators build custom profiles of ink-substrate combinations. The profiles then can be sent, if need be, to other HP Indigo 12000 or 10000 equipment for output. As long as the other press is running the same substrate as the press that was fingerprinted, the color reproduction will be identical on both. A feature that helps to minimize downtime is a quick-change system for the photo imaging plate—the rewriteable image carrier that transfers printable content to the offset blanket in HP Indigo electrophotographic devices. Automating PIP replacement, says Cacciolo, turns what used to be a 40-minute task on older HP Indigo presses into a five-minute routine on the 12000. Duggal has developed a solid relationship with HP through its ownership of the Indigo equipment and a number of HP latex wide-format printers. 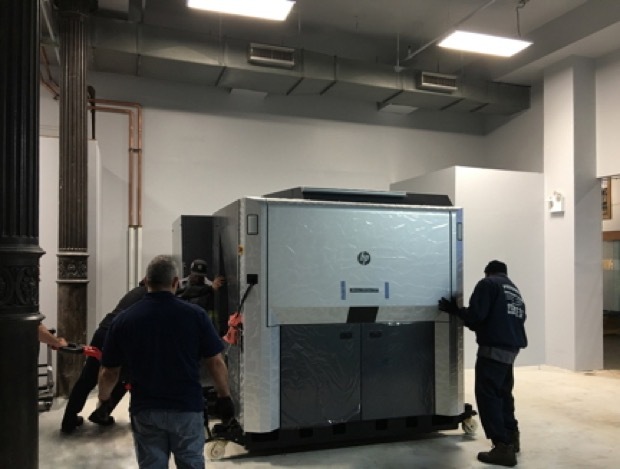 The strength of the relationship was evident when, shortly after the installation of the 12000, a trio of specialists from HP Indigo’s R&D headquarters in Israel made a surprise visit to Chelsea in order to find out whether all was going well. The visit was unannounced, but the only surprises, says Lovci, were positive encouraging ones. Baldev Duggal would have been as pleased as the Israelis and his own people by the outcome.